One of the most successful, and certainly one of the most storied American submarines of World War II, U.S.S. Wahoo was credited with sinking 20 enemy ships, for a total of 60,038 tons. Her second commanding officer, Dudley W. “Mush” Morton, is among the most famous of all American submariners. 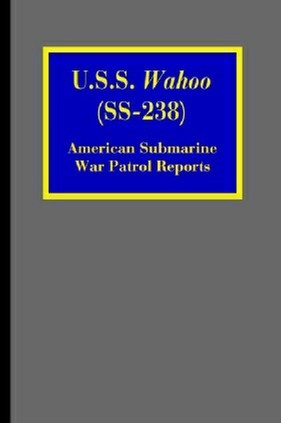 This volume contains the complete text of the official war patrol reports filed by Wahoo’s two wartime commanders, Marvin G. Kennedy and Mush Morton. Because Wahoo was lost in the La Pérouse Strait as she exited the Sea of Japan on 11 October 1943 after sinking four ships during her seventh war patrol, with the loss of all hands, an excerpt from the Navy Historical Office’s publication, United States Submarine Losses, World War II, is included in place of the never filed seventh report. In addition to the patrol reports, this volume also contains an Introduction, copious notes, and four appendices, covering the subjects of Navy Time Zones, Ship Type Designators, JANAC vs. Wartime Sinking Credits, and an article on the problems with the Mark 14 torpedo. The American fleet type submarine was arguably the most successful naval weapon of World War II. While never constituting more than 2% of total American naval forces, submarines were responsible for sinking more than half of all Japanese ships destroyed during the war. Nor was the true potential ever fully realized, for American subs spent the first 20 months of the war handicapped by torpedoes that suffered from multiple problems, which had to be found and cured one by one, as they tended to mask each other. To this day, no one knows for sure exactly how many Japanese ships were sunk, or the total tonnage destroyed. The Japanese weren’t the same sort of obsessive record keepers as their German Axis partners, and a great many of the records they did accumulate were either destroyed in bombing raids or went down with one of their ships. They also proved to be far less efficient at anti-submarine warfare than they though themselves, claiming confirmed sinkings of 468 American submarines during World War II. A truly remarkable number, particularly when you consider that total U.S. submarine losses from all causes during World War II were 52 boats.